Study shows humans feel empathy for robots in pain. In September, a Japanese man was arrested for kicking an emotion-detecting robot named Pepper in a fit of drunken rage. The $1,600 humanoid robot survived the assault but was left with some damaged, slow-moving parts. Along with measuring brain activity, the researchers also asked the participants how unpleasant they felt after observing the pictures and whether they thought the robot felt pain. While most people said the robot did not feel pain, their brain waves suggested otherwise. Part of the reason the people in the study felt empathy at all is because the robot hand looks like ours. 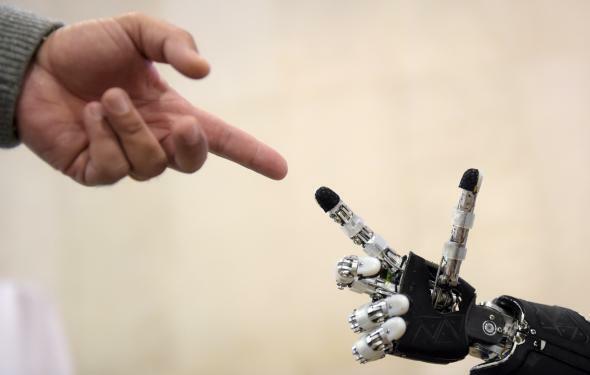 We interpret the robot hand to be humanlike, triggering the same neural reaction as if it were a real hand. “Humans have a limited set of social and emotional responses, and we apply those processes to both human and nonhuman entities,” Doug Gillan, a psychologist who has studied human-robot interaction, told me. And the more human-ike those entities are—whether it’s a physical machine or a cartoon character like WALL-E—the stronger the empathy. We could be decades away from creating a truly emotionally intelligent robot, and Sherry Turkle wants it to stay that way. Turkle, a professor of the social studies of science and technology at the Massachusetts Institute of Technology who has spent over three decades studying human-robot interaction, rejects the notion that robots could even come close to replacing human-to-human bonds.